When writing for a public forum like the Washington Times Communities we are expected to apply proper decorum to our words and thoughts, not rant and rage (though some do) and show some respect when it’s due. It seems to me that the horrid murder of 20 children and six adults by a sick, evil individual is a fairly good reason to show respect at least for a day or so. Some of my colleagues and others in the news business, politicians and the far left don’t agree. Since this is my own blog and I’m not bound by the same rules as my column on WTC, let me get this out of my system: WTF is wrong with those a**holes who couldn’t shut the f*** up for 24-f***ing hours about their g*dda*mn agendas? What tree did they fall out of? Even the lowest of the low know better than to mouth off at a time of tragedy like that. Okay, I feel better, thank-you. After monitoring all the major news outlets all weekend long for any possible updates and new information, last night I hoped to cap it all for a while by watching the prayer vigil in Newtown on TV. All the major networks were showing regular Sunday night programming, which without The Walking Dead or The Good Wife is pretty lame. They cut in only for the President’s speech. Idiots. Sorry, guess I’m still in the anger phase of grief. I finally got the entire event on Fox News, which despite being attacked by the left all the time was quite deferential to the event, the President and all the religious leaders who came out. I didn’t require it, but my 7-year-old decided to sit down, snuggle up close and be very still during all the ceremony. People who know me also know I’m not usually too positive about any president, but I did think President Obama did a wonderful job. I certainly would not have wanted to be in his position. 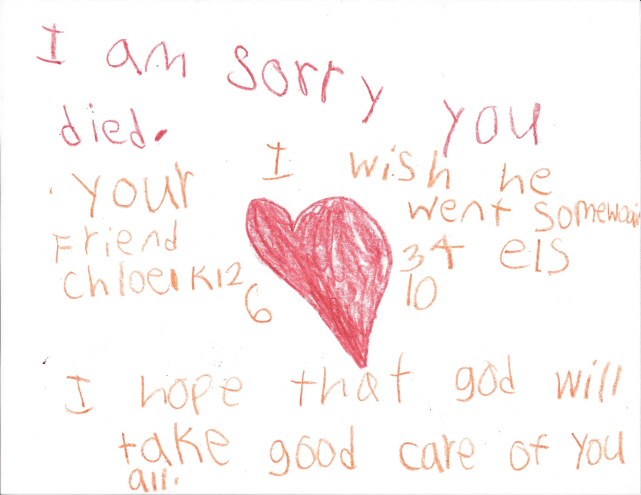 When it was over my granddaughter Chloe disappeared for a while and returned with a crudely made sign saying she was sorry the children had died, that she wished the killer had gone somewhere else, and hoping that God takes good care of them. It has some other stuff like the grades they were all in – I’m still not certain where she even got that except possibly on her own computer – and it was signed “your friend Chloe.” She signs most everything that way. I was holding it together until that moment when I saw her little face, her attempt to understand and be caring, and could think of nothing else but the unbearable grief of the parents of the dead children. I honestly don’t think it’s something I could handle, I would literally lose my mind. I gave her a big hug and we put the sign in the living room window for a while for all to see. It seemed to make her feel a little better that she did something, anything, and it made me feel a little better too. So this week’s backstory is about death, tragedy, being human, grief and, finally, the hope of one little girl whose one small voluntary act reassured me that the world will still be there tomorrow. If I could bottle up that hope and care she has I would, gladly, give it out to all the world to share. The best I can do however, is share her sign with anyone reading this. This entry was posted on December 17, 2012, 10:09 pm and is filed under The Backstory. You can follow any responses to this entry through RSS 2.0. You can leave a response, or trackback from your own site. Your spite in your expression leaves your bias overly clear. You are supposed to report not discourage. Your insults to Joe Biden are both sad and pathetic. Your comments regarding Hollywood were equally un interesting. Obama and company do know a lot, a lot more than to you or I. You should respect our leaders who are creating a safer America. Your cynicism is both un rewarding and mis aimed. Your are another part of the division bell!